Place rhubarb in unbaked 9-inch pie shell. Mix sugar, flour and sour cream and pour over rhubarb. 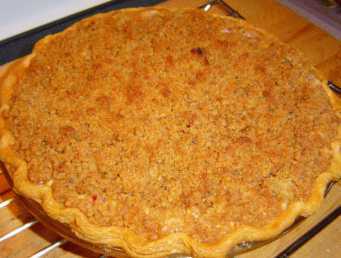 Mix flour, brown sugar and margarine until crumbly and sprinkle on pie. Reduce heat to 350*F and bake for another 40 to 60 min. This is one of my favorite pie recipes. Enjoy!